July showed a growth of 1.4% in the UK true fleet market, helping reduce the year-to-date loss to 5.6% according to latest figures by Dataforce. However, Dataforce’s Michael Gergen said this was no cause for celebration just yet, but is “certainly an encouraging trend taking into account that the YTD decrease was – 12.7% in March”. The private market scored a marginal growth of 0.1% over July 2017 and special channels increased by 2.8%, thanks to the self-registrations on dealerships and manufacturers. The total market overall almost reached 164,000 registrations for July, which equates to 1.2% growth. Volkswagen grew 35.3% and had a market share of 12.8%, which is its highest since August 2006. Success was attributed to the Golf, T-Roc and Tiguan. Vauxhall was in second, followed by Ford and Mercedes. Audi in fifth grew 4.9% and BMW in sixth gained 9.4%. Nissan remained in seventh position, while Seat in eighth jumped from twelfth with a 30.8% increase. Kia came ninth while Peugeot managed to eke into the top ten, thanks largely to the 308 hatchback, rather than a more predictable SUV, Gergen commented. The compact and small SUV sectors proved the most popular, with the Nissan Qashqai, Volkswagen Tiguan and Ford Kuga contributing to a 22.8% SUV compact market share. Making an interesting case, until August 2016 the SUV share at Seat was zero. 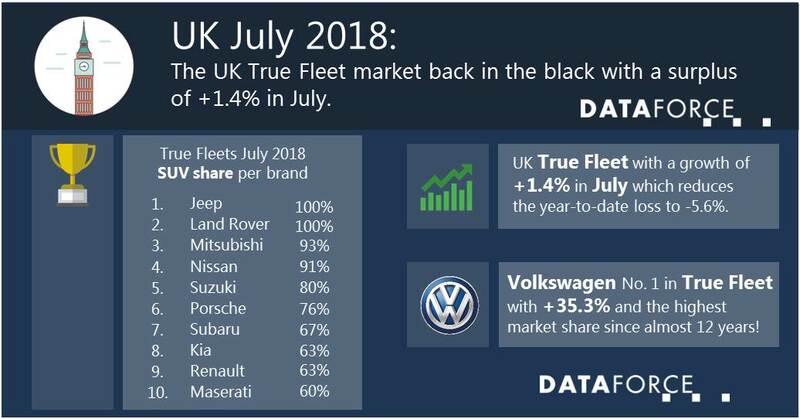 This has changed with the introduction of Ateca and Arona and in July 2018 the share was no less than 37% in the true fleet market. Across the top 25 brands in July SUVs accounted for 40.9% registrations compared to 32.9% in July last year.